Everyone knows that working at height can be a risky task but few believe that smaller jobs just a few feet off the ground can be just a hazardous. Very often it is not just the height of the fall that can be so dangerous but how you fall and the wide range of other contributing factors that need to be taken into consideration. That is why it is imperative to have the right tools for the job even if you are only working a few feet off the ground. Tackling those small jobs at height can be easily overcome with a stable podium step to help you to maximise safety while eliminating risk. Podium steps are so much safer than wobbly ladders or dodgy set-ups, offering contractors a safer working platform enabling them to get on with their work quickly and efficiently. 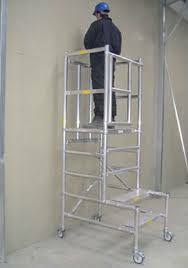 Work at Height Regulations (WAHR) advise that podium steps and other platforms offer greater stability and are a safe working alternative to step ladders especially those fitted with guard rails. Builders, contractors and even DIY enthusiasts are opting to turn their backs on the traditional ladder and settling for podium step hire as a real alternative. To hire podium steps all you need to do is pick up the phone and all the equipment you need will be on site next day without fail. Podium step hire can give you easy access to walls and ceilings and each piece of kit comes with its own guard rail which means if you lose your balance you will be taking a stumble, not a trip to hospital. Podium step hire is easy and it offers great value for money. 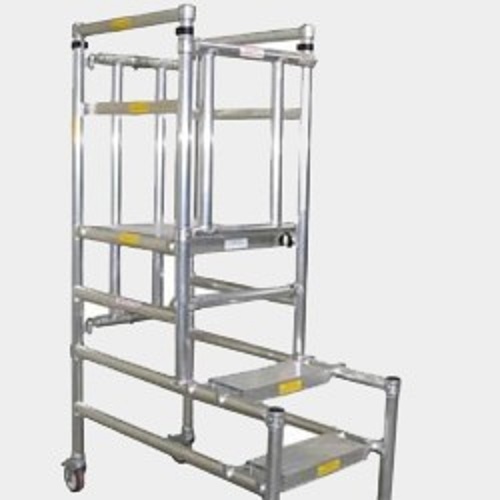 Consisting of a lightweight manoeuvrable piece of equipment weighing less than 25kg, podium steps offer you a stable working platform of up to 1.17 metres high which is completely safe whether you are working alone or as part of a team. This equipment is perfect for plenty of small jobs at height whether you are working inside or out. 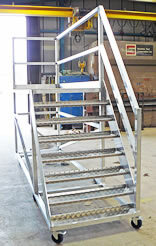 In terms of efficiency, having the right type of podium steps can even increase your work rate on site. A comfortable contractor will work faster than someone who is overstretched or cramped and they will produce a better quality of work. Other features include an anti-slip platform which allows you a 360-degree working access. Podium steps are easy to store on site. They fold flat, and can be assembled in less than 15 seconds.